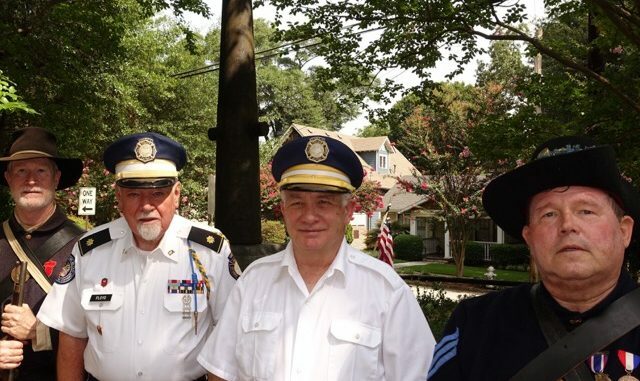 Gathered in Atlanta’s Kirkwood neighborhood at the MG James B. McPherson monument, 1400 McPherson Ave., SE, Atlanta, are, from left, John McGilvray, of River Overlook in Lawrenceville, David L. Floyd, of Kellogg Dr. in Lilburn, Samuel R. Alston of Valley Green Dr. in north Atlanta, , and Allan Bright, of Russell Avenue in Decatur. The Battle of Atlanta Commemorative Organization conducted tours of the McPherson monument and one honoring MG William H.T. Walker at the intersection of Wilkinson Dr. and Glenwood Ave. on July 23. His was 152 years and a day since McPherson, commanding the Union Army of Tennessee, and Walker, commanding a Confederate division in Hardee’s First Corps., both died in the American Civil War battles of Atlanta. McGilvray and Bright are members of the Sons of Union Veterans, McPherson Camp. Floyd and Alston represented the Old Guard of the Gate City Guard. These organizations are affiliated with the Centennial Legion, a national group of historic military units. Both local units have contributed significantly to the restoration of the two monuments, a project of the Battle of Atlanta Commemorative Organization chaired by Henry Bryant who lectured at the two monuments.